Samsung has introduced the new galaxy models at MWC 2018 in Barcelona on 25th February 2018 named Samsung Galaxy S9 and Samsung Galaxy S9+. The Samsung Galaxy S9 price starts at $720 (approx Rs. 46,600) while the Samsung Galaxy S9+ will be available at $840 (approx Rs. 54,400). Both smartphones come with multiple color options like Black, Blue, and Purple which are also priced the same. The Samsung Galaxy S9 features a 5.8-inch QHD+ Super AMOLED display with Corning Gorilla Glass 5 protection. The device is powered by a 2.3GHz octa-core Exynos 9 chipset processor that ensures smooth performance to the users. The Galaxy S9 comes with 4GB of RAM and runs on Android 8 Oreo out of the box. The Samsung Galaxy S9 measures 147.7 x 68.7 x 8.5mm and weighs 163 grams. Coming to the camera, Samsung Galaxy S9 has a SuperSpeed Dual 12-megapixel rear camera with dual-tone LED flash that captures stunning images and an 8MP selfie shooter on the front. You can also create emoji stickers using the camera. A 3000mAh battery powers the Galaxy S9 smartphone and also supports wireless charging. There is a 64GB and 256GB storage variants which can be expandable up to 400GB Using a MicroSD Card support. The Smartphone also has features like Iris scanner, Fingerprint Scanner, and Face Detection. 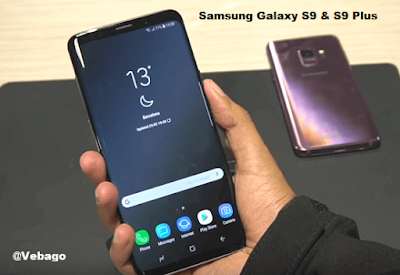 Connectivity options on the Samsung Galaxy S9 include Wi-Fi 802.11 a/b/g/n/ac, 3.5mm audio jack, Bluetooth v5.0, and USB Type C.
The Samsung Galaxy S9 Plus features a 6.2-inch QHD+ Super AMOLED display with a protection of Corning Gorilla Glass 5. It comes with 6GB RAM and has a 64GB and 256GB internal storage which can be extended up to 400GB via MicroSD Cards. The Samsung Galaxy S9+ also has a SuperSpeed Dual 12-megapixel rear camera with dual-tone LED flash that captures stunning images and an 8MP selfie shooter on the front. By using the camera, you can also create emoji stickers. The Samsung Galaxy S9+ measures 158.1 x 73.8 x 8.5mm and weighs 189 grams. The device also has features like Fingerprint Scanner, Iris scanner, and Face Detection. Connectivity options on the Samsung Galaxy S9 Plus include Wi-Fi 802.11 a/b/g/n/ac, 3.5mm audio jack, Bluetooth v5.0, and USB Type C.